As Sir John Gielgud said, there is no such thing as a small part, only small actors, and Murray Melvin is a huge presence in any film, even when he has few lines. With his pursed lips, long face and fabulously economical style – he can deliver a crushing put-down without saying a word – he is the bridge between realism and camp. 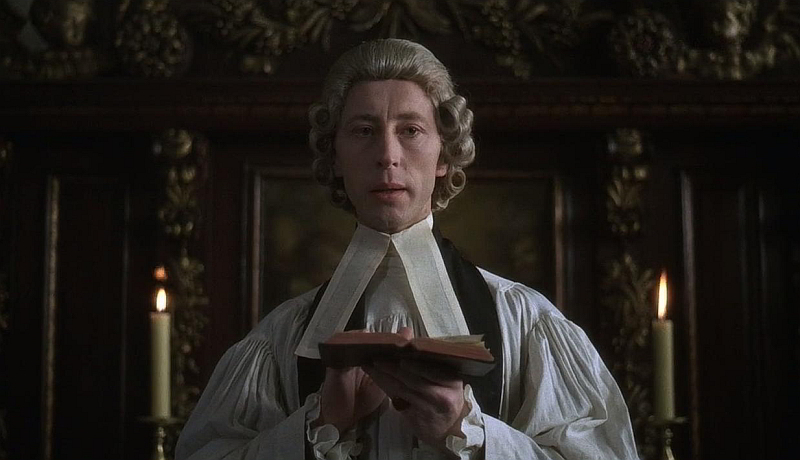 I have nothing obvious in common with him, but still, I should like to nominate as my alter ego Reverend Samuel Runt, the dour, repressed clergyman played by Melvin in Stanley Kubrick’s Barry Lyndon. Melvin’s performance in this role is deliciously complex. He is obsequious to his employer, the wan beauty the Countess of Lyndon (Marisa Berenson), and yet, due to his position as a man of the cloth, he holds power over her and the rest of the household, which he exercises with theatrical homilies and gravely sententious asides. He does not have enough power to stop the disaster of her marriage to Barry Lyndon, however; he is a sort of failed Rasputin. In my mind, as I was writing Viper Wine, I had Murray Melvin play the part of Chater, the personal priest of Venetia, Lady Digby. Their relationship is similar to that of the Reverend Runt and the Countess, and yet it goes further. Chater advises on her dress; he is secretly, and without hope, in love with her husband, Sir Kenelm Digby. His prurient interest in all their doings I shared. As the author of the novel, I was in control of these characters, and yet in another sense, I could only look on with longing as they went about their business. Like the Reverend Runt, I sometimes felt they could neither see nor hear me, though in the end, I knew I would have the final word.